In GIMP, a pattern is a small image used to fill areas by placing copies of side by side. See the Patterns section for basic information on patterns and how they can be created and used. You can use them with the Bucket Fill and Clone tools and the Fill with pattern command. The “Patterns” dialog is used to select a pattern, by clicking on it in a list or grid view: the selected pattern will then be shown in the Brush/Pattern/Gradient area of the Toolbox. A few dozen more or less randomly chosen patterns are supplied with GIMP, and you can easily add new patterns of your own. The “Patterns” dialog is a dockable dialog; see the section Section 2.3, “Dialogs and Docking” for help on manipulating it. From the Toolbox, by clicking on the pattern symbol in the Brush/Pattern/Gradient area (if you have checked the “Show active brush, pattern and gradient” option in the toolbox preferences). from the Tab menu in any dockable dialog by clicking on and selecting Add Tab → Patterns. From the Tool Options dialog of the Clone tool and the Bucket Fill tool, by clicking on the pattern source button, you get a pop-up with similar functionality that permits you to quickly choose a pattern from the list; if you clic on the Bucket Fill button present on the right bottom of the pop-up, you open the real pattern dialog. Note that, depending on your Preferences, a pattern selected with the pop-up may only apply to the currently active tool, not to other paint tools. See the Tool Option Preferences section for more information. In the Tab menu, you can choose between View as Grid and View as List. In Grid mode, the patterns are laid out in a rectangular array, making it easy to see many at once and find the one you are looking for. In List mode, the patterns are lined up in a list, with the names beside them. Independent of the real size of a pattern all patterns are shown the same size in the dialog. So for larger patterns this means that you see only a small portion of the pattern in the dialog at all - no matter whether you view the dialog in the list or the grid view. To see the full pattern you simply click on the pattern and hold the mouse button for a second. In the Tab menu, the option Preview Size allows you to adapt the size of pattern previews to your liking. At the top appears the name of the currently selected patterns, and its dimensions in pixels. In the center appears a grid view of all available patterns, with the currently selected one outlined. Clicking on one of them sets it as GIMP's current pattern, and causes it to appear in the Brush/Pattern/Gradient area of the Toolbox. In this view, instead of a grid, you see a list of patterns, each labeled with its name and size. 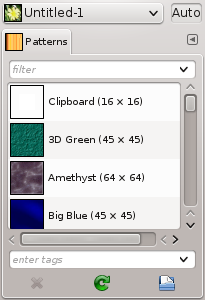 Clicking on a row in the list sets that pattern as GIMP's current pattern, just as it does in the grid view. If you double-click on the name of a pattern, you will be able to edit the name. Note that you are only allowed to rename patterns that you have added yourself, not the ones that are supplied with GIMP. If you edit a name that you don't have permission to change, as soon as you hit return or move to a different control, the name will revert back to its previous value. Everything else in the List view works the same way as it does in the Grid view. Pressing this button removes the pattern from the list and causes the file representing it to be deleted from disk. 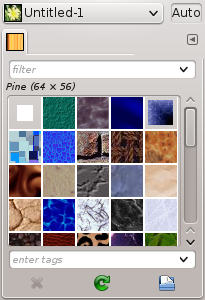 Note that you cannot remove any of the patterns that are supplied with GIMP and installed in the system patterns directory; you can only remove patterns that you have added to folders where you have write permission. Pressing this button causes GIMP to rescan the folders in your pattern search path, adding any newly discovered patterns to the list. This button is useful if you add new patterns to a folder, and want to make them available without having to restart GIMP. If you click on this button, the current pattern is opened in a new image window. So, you can edit it. But if you try to save it with the .pat, even with a new name, you will bang into a “Denied permission ” problem because this image file is “root”. But this is possible under Windows, less protected. You can use tags to reorganize the patterns display. See Section 3.6, “Tagging”. You get it by right-clicking on the “Patterns” dialog. The commands of this menu are described with Buttons, except for Copy Location which allows to copy the path to pattern into clipboard. When you use the Copy or Cut command, a copy appears as a new pattern in the upper left corner of the Patterns dialog. This brush will persist until you use the Copy (or Cut) command again. It will disappear when you close GIMP. You can save this clipboard pattern by using the Edit → Paste as → New pattern as soon as it appears in the Patterns dialog.